One out of three people report experiencing persistent stress and excessive anxiety on a regular basis. Stress can cause bothersome symptoms, like insomnia, fatigue, and irritability. 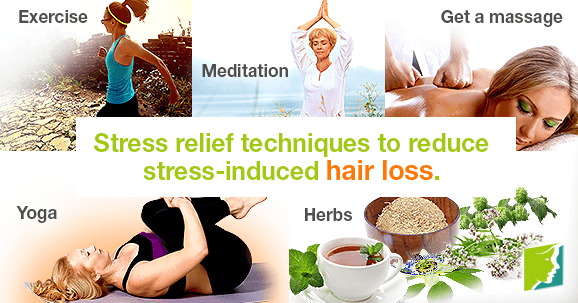 Stress is also one of the leading causes of hair loss. Hair loss is a discouraging part of aging, and stress can accelerate the process. It is essential to try and manage stress to prevent premature hair loss. Keep reading to learn more about ways to manage stress and useful tips for preventing hair loss. These methods of relaxation and can calm stress and anxiety, helping to reduce stress-induced hair loss. Yoga is a beneficial relaxation technique that also improves flexibility, incorporates breathing exercises, helps clear the mind, and tones the muscles in a low-impact manner. An effective way to reduce stress and anxiety is to exercise regularly. It is generally recommended to get at least 30 minutes of aerobic activity five times a week. Exercising releases "feel-good" neurotransmitters in the brain, like serotonin, and significantly increases energy levels and improves mood. Walking, cycling, and swimming are all good forms of low-impact workouts that can help with stress and anxiety. This popular relaxation technique involves repeating a series of soothing statements to yourself or letting your mind go blank. Meditation can help relieve stress and anxiety after a long day. A professional massage can be valuable for reducing anxiety and stress. This option can be a little expensive, but a good massage is worth it - and it is important to treat yourself on occasion. Sedative herbs can help relieve stress and anxiety, calm the nerves, and soothe restlessness. Kava root, hops, valerian, lemon balm, and passion flower are all soothing herbs that are widely used for treating stress and anxiety. Keep reading to learn more about ways to manage stress and prevent hair loss. Vitamins A, B, C, and D are all essential vitamins that help prevent hair loss. These vitamins are necessary to protect and hydrate the hair and scalp while restoring shine and strength to hair. Massage onion, ginger, or garlic juice onto scalp, leave overnight, and rinse in the morning. This treatment nourishes the scalp and prompts hair growth. Make a strong cup of green tea (with two tea bags in a cup), wait until it is warm, apply to the scalp, leave for an hour, and then rinse. The antioxidants in the green tea help to prevent hair loss. Stress can accelerate hair loss. There are several natural ways to treat stress-induced hair loss. These methods include consuming a balanced diet and exercising regularly to reduce stress. It is vital to manage stress for your overall well-being, as well as for your appearance. Hair loss or hair thinning commonly occurs during menopause. Hair loss can have several different causes, and different treatments are available.